The legendary Q-Tip, of A Tribe Called Quest, finally gets an official release for his long-delayed 2001 album Kamaal the Abstract. A musical hybrid, Kamaal was ahead of its time in 2001 (at least, for the label execs), but some say it's even more apropos in 2009. Q-Tip produced the entire album himself, even playing several instruments, mixing up soul, supa-cool jazz, headnodding hip-hop, and organic pop magic in the vein of Stevie Wonder or Prince. 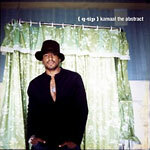 At the same time, Kamaal the Abstract still boasts all the earmarks of Q-Tip's inimitable mic control. The album has been re-mixed and re-mastered for sonic impact. Better late than never! Please note: advance publicity said this release would retain the original album artwork, but the label provided the artwork shown above. Also, the track listing shown here may be subject to change.